Power up your project management by combining GDrive with Trello, Slack, or Asana. Collaboration is Google Drive’s killer feature, so it’s not surprising that several team-oriented tools have integrated Drive into their services. Plenty of their users are already using Drive to create documents and spreadsheets and store all their files. By connecting your Google account with one of these robust collaboration apps, you can easily add files to projects, link them to tasks, or share them with team members. Trello is a popular web-based project-and-task-management tool. It lays out your projects as a series of lists. Each list item—called a “Card” in Trello parlance—can contain attachments, checklists, images, deadlines, and discussion notes. Cards can be dragged and dropped between lists. Trello’s interface is ideal for visual thinkers, and it’s flexible enough to work as a collaboration tool for business teams, a personal planner, and even a GTD system. 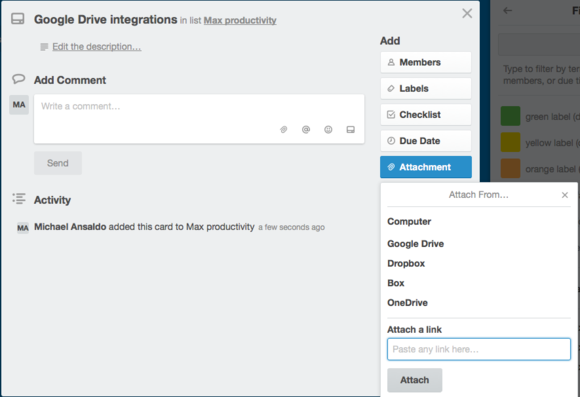 You can attach Google Drive files to any Card in Trello. You can add files to your Trello account directly from Google Drive. Just open a Card, click Attach File then select Google Drive. Choose your files and click Select to upload. Most teams use multiple tools to collaborate: chat programs for quick messages, email for longer discourse and sending files. It can make communication clunky. Slack streamlines the process by bringing all communications into one tool. Conversations are organized into channels. You can create channels for projects, departments, or any other team grouping that makes sense, and they can be private or public. You can also attach files to share with with other team members. 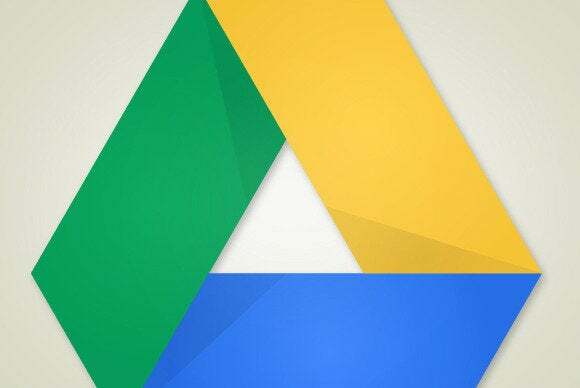 Google Drive files shared in Slack retain their original permissions. One of Slack’s many strengths is its integration with a variety of third-party apps, including Google Drive. To share a Drive file with a team member, paste the link to the file into your message and it will create a thumbnail preview. Files retain their original permissions set in Drive, and any changes to the file will be automatically synced. Best of all, attached files become searchable in Slack. Asana has evolved from a task tracker into a full-featured project management tool. Asana started out as a team task tracker but has evolved into a full-featured project management tool. You can break down projects into smaller tasks and assign them to collaborators, communicate with team members, and track goals and deadlines. Of course, you can also upload project files to Asana. From Asana’s task pane, click the paper-clip icon, select Attach From Google Drive, and pick your file. It will be added along with the Google Drive icon.